One of my favorite places in the world is Muir Woods in my native California, just north of San Francisco. But not because of the Redwood trees for which it is famous. It’s the smell of the California Bay Laurel tree that is forever etched in my mind. Whenever I’ve gone through difficult times, I’ve retreated to Muir Woods, spending hours and hours there in my favorite grove: smelling the trees, watching the light flicker across the ground as the wind blows, listening to the water burbling across rocks. Perhaps that is why my favorite color turns out to be green, even though, for the longest time, I thought it was plummy purple. This shawl, with its leaves and mesh pattern, reminds me of the light flickering through the Bay leaves in the most peaceful and lovely corner of my universe. I can almost smell it now! Note: Correct gauge is not essential for this project. The chart for this pattern is large. Please click here to see the chart [now in PDF format]. It should print neatly on a single sheet of letter-sized paper. Use the Russian Join to join yarn ends when necessary. Instructions for the Russian Join can be found here. 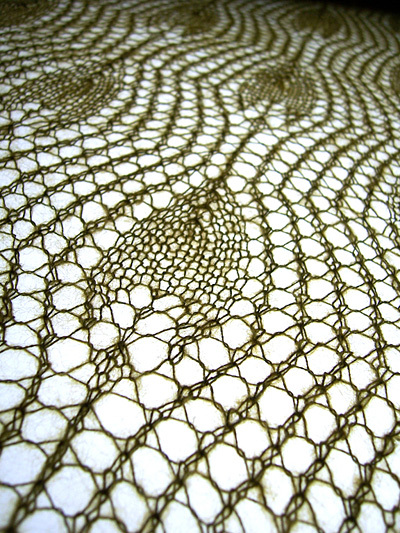 Information about wet-blocking lace can be found here and here. S2KP: Slip next 2 sts together to right needle, as if working a k2tog; k next st, pass slipped sts over. SK2P: Slip next st knitwise, k2tog, pass slipped st over. Make Picot: CO 2 sts using Knitted Cast On; k2tog tbl, k1 tbl, pass first st worked over second st as if binding off. A tutorial for an alternate way to work the Crochet Cast On can be found here. If you use this method, k 1 row using the working yarn before beginning to work the pattern. Using Crochet Cast On, CO 125 sts. Leave a yarn tail at beginning of CO row, at least 6 inches long. Work Rows 1-32 of Lace Chart 13 times, then work Rows 1 and 2 once more. Pattern Repeat will be worked 3 times in each row. Row 1 [RS]: K2, ssk, yo, k1 tbl, p to last 5 sts, k1 tbl, yo, k2tog, k2. Row 2 [WS]: K all sts. Row 3 [RS]: Make picot, k1, ssk, yo, k1 tbl, [yo, k2tog] to last 2 sts, k2. Row 4 [WS]: Make picot, k to end. Rows 5 & 6: K all sts. Rows 7 & 8: Make picot, k to end. Rows 9 & 10: K all sts. BO as follows: [Make picot, BO 2 sts, sl st from right needle back to left needle] to end of row, making 1 picot at end of row. Break yarn and sew end into border so that last picot sits properly. Carefully remove waste yarn from CO edge, placing resulting live sts on needle. Join yarn to tail from CO using Russian Join. 125 sts on needle. The next row is a bit tricky; try it out on a swatch first if you wish. It is intended to carry the 5-stitch border unbroken along the side, rather than having an obvious half stitch offset. It’s worth the effort! Row 1 [RS]: P3, k1 but do not drop st from left needle, k2tog but drop only first st from left needle do not drop second st from needle, p2tog (second st of k2tog just worked is purled together with next st), p to last 6 sts, p1 but do not drop st from left needle, k2tog but drop only first st from left needle do not drop second st from needle, k1, p2, p2tog. Row 2 [WS]: P2, p2tog, yo, p1 tbl, k to last 5 sts, p1 tbl, yo, p2tog, p2. Row 3 [RS]: Make picot, p2, k2, [yo, k2tog] to last 6 sts, yo, k2tog, k1, p3. Row 4 [WS]: Make picot, p1, p2tog, yo, p1 tbl, k to last 5 sts, p1 tbl, yo, p2tog, p2. Work Rows 5-10 and BO as for Upper Border. 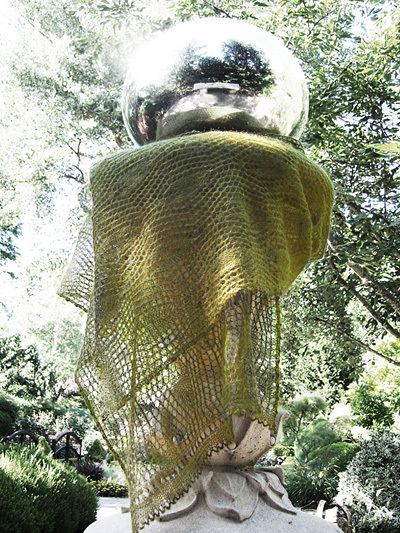 Wet block shawl. 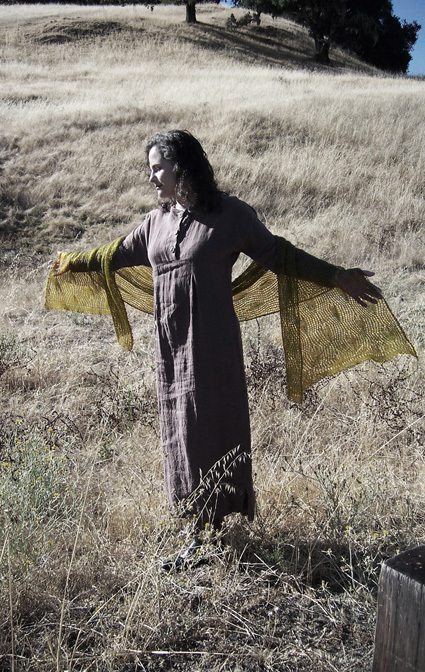 Links to two excellent articles about blocking lace can be found in the Pattern Notes above. 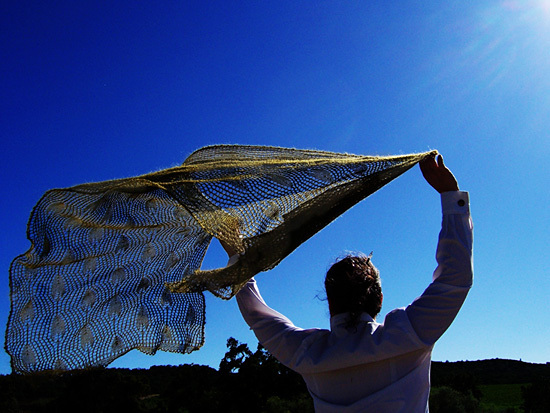 If using blocking wires or string, thread through columns of yarnovers along side edges of shawl, and through both yarnovers and picots at ends of shawl. Rosemary (aka Romi) lives with three wonderful men in wine country. 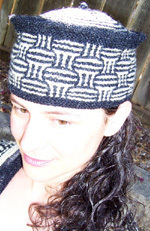 In 2005 she became a purveyor of shawl, scarf and sweater pins when she launched Designs by Romi, and since then it's been taking up most of her time. Right now, she's hard at work on a book for Interweave Press on knit and crocheted jewelry. She's just happy to be mixing work with play! Drop by her blog to see what she’s up to these days!